War is an ugly thing, but not the ugliest of things. The decayed and degraded state of moral and patriotic feeling which thinks that nothing is worth war is much worse. The person who has nothing for which he is willing to fight, nothing which is more important than his safety, is a miserable creature and has no chance of being free unless made and kept so by the exertions of better men than himself. This is the story of a legend that proved that Africa and indeed Nigeria could hold its own even in the international arena. Enter the world of Baba Yusuf Buratai, a veteran of the World War two, a legend who despite all odds made his mark in his lifetime, and not only that, he left behind a legacy in the mould of a gift to humanity and Nigeria, which is the current Chief of Army Staff, Lt. General Tukur Yusufu Buratai. Baba Buratai may have crossed to the great beyond, but his legacies would ever remain fresh in our hearts. For those who knew him, one thing was constant. He was a man of unequal bravery and dedication. He believed in the unity of Nigeria and humanity. He fought for peace to reign in his lifetime. Though not an academic, his counsels stood germane then, now and would continue in the future. Little wonder the exploits of his son, Lt. General Tukur Buratai in the current fight against the Boko Haram Insurgency. When Lt.General Tukur Buratai took over the helms of affairs of the Nigerian Army, many didn’t know his background as the son of a World War 2 veteran. Not many knew he was a man of steel. Not many knew he had a mentor who had shared war memoirs with him. Not many knew his antecedents and doubted his ability to deliver on the job. 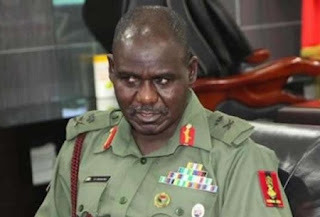 In some quarters, it is said that Baba Buratai bequeathed his son to Nigeria in 1981 when he enrolled at the Nigerian Defence Academy, Kaduna. He carefully watched his progress in the Nigerian Army. He was always there to render advice to him. And one of which was to be loyal to his superiors and constituted authority. Given the sweep of his life, the scope of his accomplishments, the adoration that he so rightly earned, it’s tempting I think to remember Baba Buratai as an icon, smiling and serene, detached from the tawdry affairs of lesser men. In his lifetime, he taught the power of action, but he also showed us the power of ideas; the importance of reason and arguments; the need to study not only those who you agree with but also those who you don’t agree with. For the entire Buratai family, for those he inspired in Borno and other parts of the country, Baba Bauratai’s passing is rightly a time of mourning, as well as a time to celebrate a heroic life. But it should also prompt in each of us a time for self-reflection. With honesty, regardless of our station or our circumstance, we must ask: How well have I applied his lessons in our own lives? One of Baba’s greatest legacies remains his contributions to humanity as a WW2 Hero, who saw to global peace for all humanity. We all know of his record as a soldier, and he was a tough soldier. Baba was a man of the land. He defended this nation like a lion, and he taught its children to swing a scythe. He was a military legend in his lifetime, and he indeed passed the baton to his son, Lieutenant General Tukur Yusufu Buratai, who has graciously continued to do the nation proud in the war against Boko Haram insurgents. Baba was indomitable; he had a north star that guided him. A north star from which he never deviated. His north star was the survival of the Nigerian nation. Nigeria has indeed lost a dear man and a bold warrior. We are therefore consoled by the fact that Baba lived to witness some of the most significant exploits of the Chief of Army Staff, Lt. General TY Buratai and the humbling of Boko Haram in his lifetime. In some instances, Baba felt like returning to the battlefront to confront the Boko Haram Insurgents, but strength failed him. His consolation was that his son was leading the onslaught, which brought him happiness. We stand with our country and the rest of the world to mourn with the Chief of Army Staff, the Buratai family, and the entire nation. If wishes were horses, Baba would remain with us. But who are we to question God? But we are consoled with his exploits here on earth and the legacies he left behind. We are also comforted by the fact that his son, Lt. General TY Buratai indeed proved himself worthy of leading the war against the Boko Haram Insurgents. While Baba might not be with us in the flesh, he remains with us in spirit. We use this medium to assure the Chief of Army Staff, Lt. General TY Buratai that his efforts towards keeping Nigeria one would not go in vain. We also want to charge him to continue his good works and never to relent. If not for anything, to continue to make Baba proud wherever he is. We also know that the entire Buratai family has lost a great patriarch. We console with them. May Allah SWT grant you and your family sabr (sabar) in this challenging time and reward you with Khair both in this world and the next. Ameen. May Allah SWT grant him Jannatul-Firdaus and forgive his sins. May He make his grave a place of comfort and light. Ameen. May Almighty Allah dwell him in Jannataul-Firdaus, the most beautiful paradise. May Allah SWT in his mercy, grant him rest, may his grave be a part of Jannatul Firdaus and an abode of light. May Allah make him pass successfully in all the stages of the life after death. Ameen. OKANGA sent in this Tribute from Agila, Benue State.